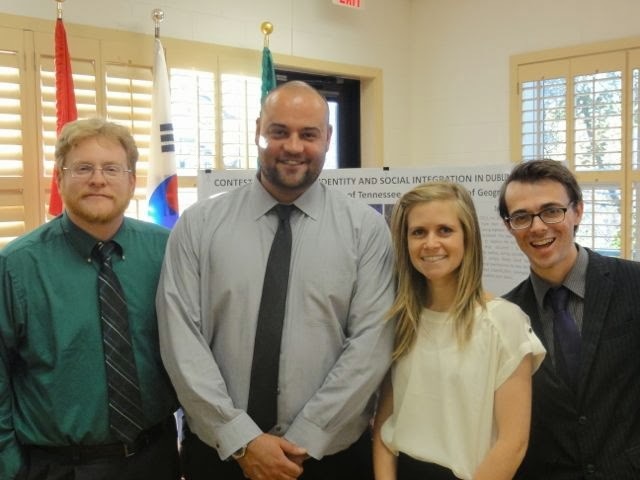 Three Geography graduate students presented their research at the W.K. McClure Symposium for the Study of World Affairs in November 2013. 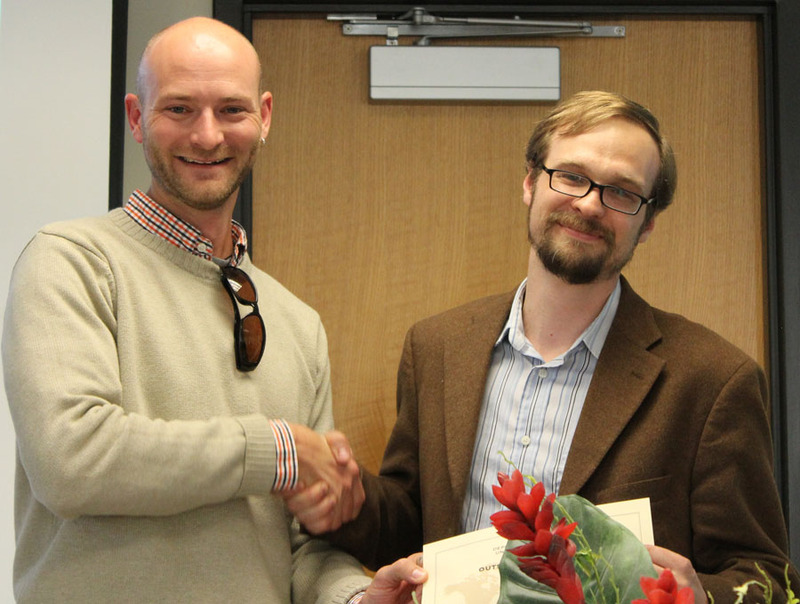 The students had received McClure scholarships for international field study for thesis or dissertation research. Pictured from left to right: Dr. Derek Alderman (Department Head), Neil Conner, Anna Alsobrook, Scott Basford. The reception of the UTK Geography Department before the start of the 2013 Fall semester was held in the lobby of the McClung Museum on campus (Circle Park) on Monday from 4:00 to 6:00 pm, August 19, 2013. The Tennessean published a Guest Column written by Kurt Butefish in support of geography education in Tennessee: http://www.tennessean.com/article/20130723/OPINION03/307230019/2071. 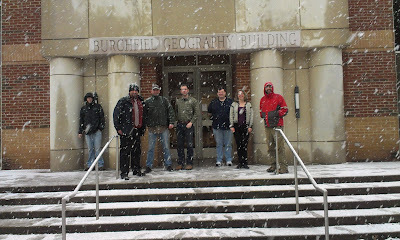 Kurt Butefish is coordinator for the Tennessee Geographic Alliance. 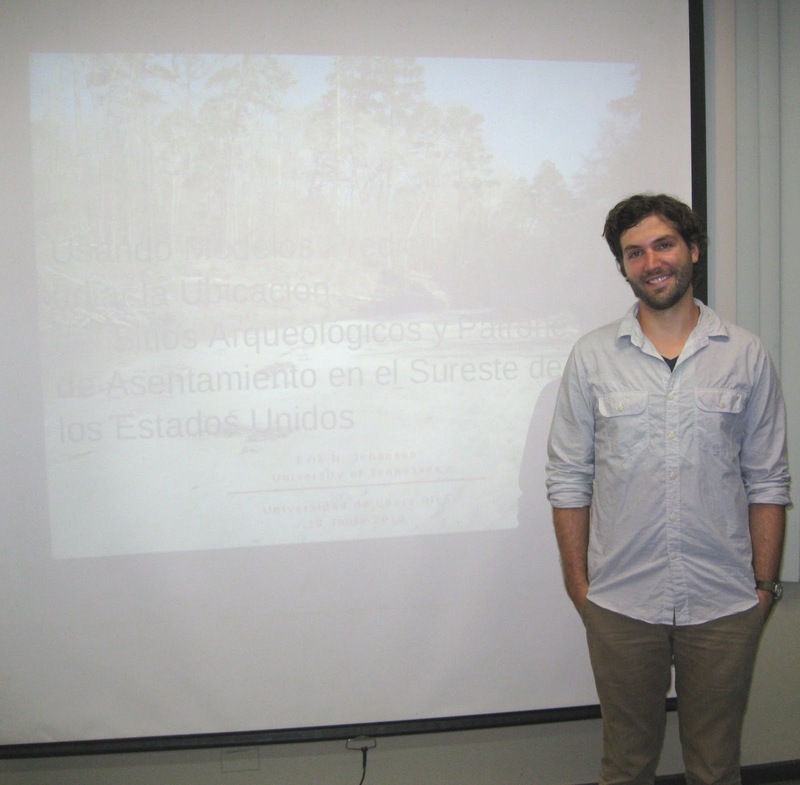 During a recent visit to Costa Rica together with Professor Sally Horn, graduate students Erik Johanson and Matthew Kerr presented invited lectures in the School of Anthropology at the University of Costa Rica. 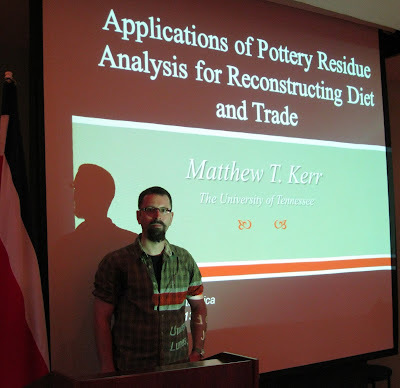 Erik Johanson shared results from his MS thesis research with Dr. David Anderson in the Department of Anthropology at the University of Tennessee in a lecture entitled, "The Use of GIS to Predict the Location of Archaeological Sites in the Southeastern U.S."
Matthew Kerr gave a lecture on "Application of Pottery Residue Analysis for Reconstructing Diet and Trade" that focused on his undergraduate research with Dr. Nora Reber at the University of North Carolina, Wilmington. Both lectures were very well received, as was the Spanish translation and comic relief provided by Sally Horn. Follow the link below to a video clip from Matthew Kerr's presentation. 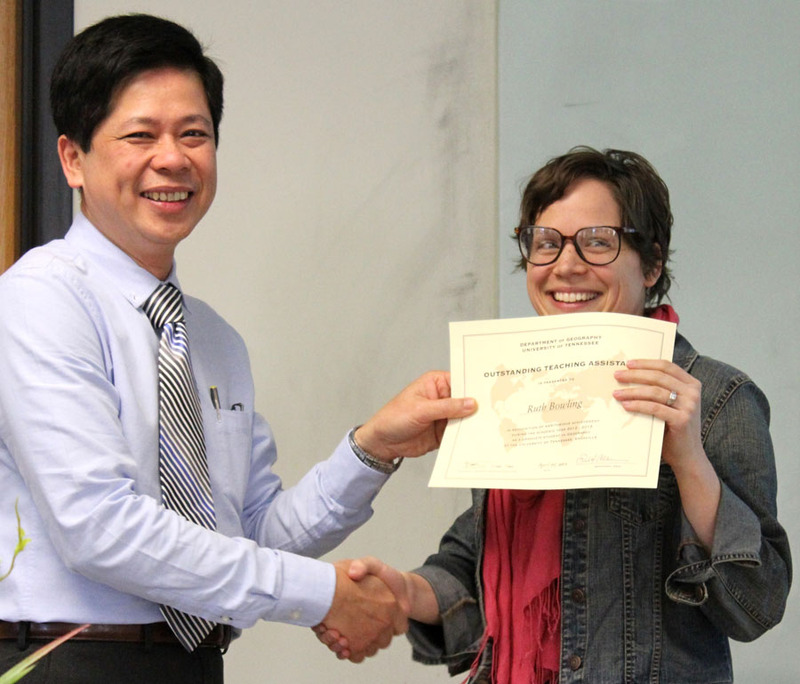 The Geography Department's 2012-2013 Award Ceremony was held at the Burchfiel Geography Building on Thursday, April 25, 2013. 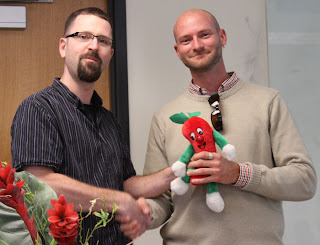 The reception was in Rm 405 from 3:30-4:00 pm followed by the awards presentations in Rm 301. Dakota Anderson: Graduating senior in Geography; President of Club Geography. Dakota Anderson has shown the most leadership among our current undergrads. He did an independent study course with me and I was impressed by the degree to which he took responsibility and really challenged himself. 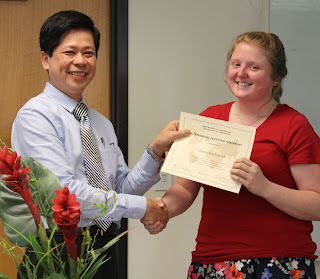 Chaney Swiney: Graduating senior in Geography; Student assistant in Geography Cartography Lab; Honors thesis with Dr. Harden; An honors project in biogeography with Dr. Horn. Chaney completed an honors thesis in geography entitled “Suspended Sediment Concentrations in Three Tributaries of the Little River.” He collected samples of storm water from three streams in Blount County and processed those samples in the lab to determine their suspended sediment concentrations. Chaney then compared those values to measures of suspended sediment obtained by others over the past decade and related them to the amount of rain in each storm event. Chaney was also awarded a National Geographic Society internship. 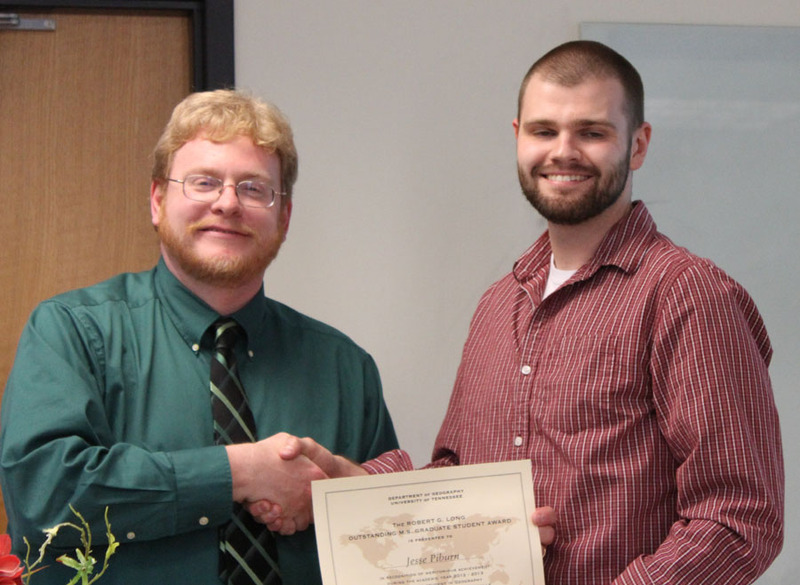 He will intern with the society’s cartography group in Washington, DC this summer. 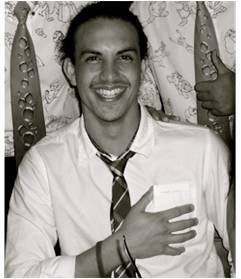 Erik Schmidt: Fieldwork assistant for Dr. Alderman’s project in New Orleans; Student assistant in Cartography Lab. 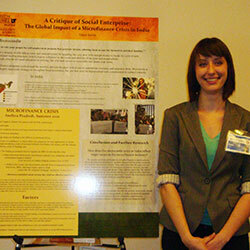 A poster presentation at SEDAAG made an important contribution to the plantation project. Erik’s research results provide an early and valuable glimpse into the data collected, especially the geographic origin of visitors to the River Road plantations. With the help of the UT Cartography Lab, he produced impressive maps in less than a month after receiving the cleaned survey data. I can think of few undergraduate students who I would trust with such a critical task and who could pull this off so effectively. Erik is obviously one of those students. 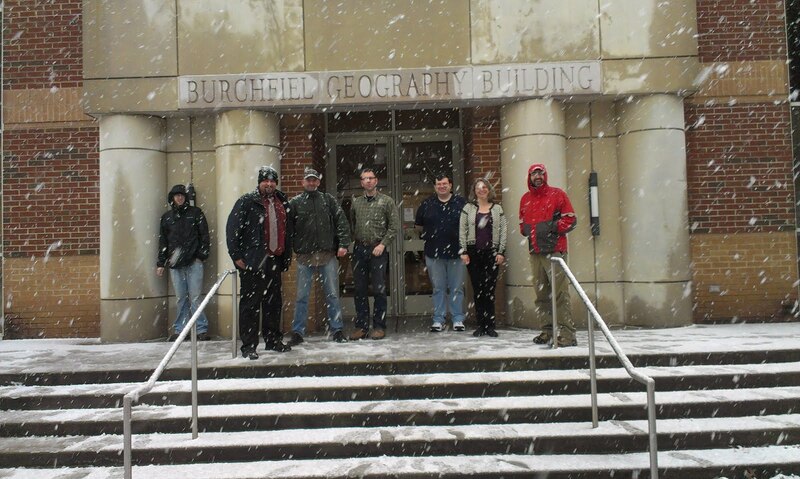 November 2012: Participation in the Geography Bowl @ SEDAAG for UT Geography Dept. 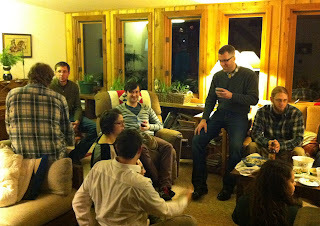 Henri D. Grissino-Mayer, Justin T. Maxwell, Grant L. Harley, Niki A. Garland, David H. Holt, Carl Absher, B. Jacob Beale, Mathew S. Boehm, Kristen A. de Graauw, Anna-Maria Rautio, and Alex W. Dye. 2013. Dendrochronology Reveals the Construction History of an Early 19th Century Farm Settlement, Southwestern Virginia, USA. Journal of Archaeological Science 40(1):481-489. 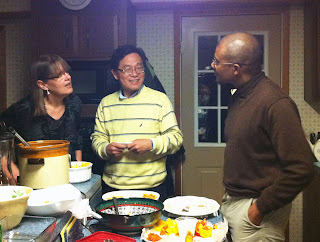 Jochem, Warren C., Kelly Sims, Edward A. Bright, Marie L. Urban, Amy N. Rose, Phillip R. Coleman, and Budhendra L. Bhaduri. 2012. "Estimating traveler populations at airport and cruise terminals for population distribution and dynamics." Natural Hazards. doi: 10.1007/s11069-012-0441-9. Omitaomu, Olufemi A., Brandon R. Blevins, Warren C. Jochem, Gary T. Mays, Randy Belles, Stanton W. Hadley, Thomas J. Harrison, Budhendra L. Bhaduri, Bradley S. Neish, and Amy N. Rose. 2012. "Adapting a GIS-based multicriteria decision analysis approach for evaluating new power generating sites." Applied Energy no. 96 (0):292-301. doi: http://dx.doi.org/10.1016/j.apenergy.2011.11.087. Horner, J.D., Cross Steele, J., Underwood, C.A., and Lingamfelter, D. 2012. Age-related changes in characteristics and prey capture in seasonal cohorts of Sarracenia alata pitchers. The American Midland Naturalist 167: 13–27. Johanson, Erik N. 2012. Predictive Modeling in Western Louisiana: Prehistoric and Historic Settlement within the Kisatchie National Forest. Special Publication Number 1. Kisatchie National Forest, Louisiana. Nandi, A., and Luffman, I., 2012. Erosion Related Changes to Physicochemical Properties of Ultisols Distributed on Calcareous Sedimentary Rocks. Journal of Sustainable Development, Vol. 5(1): pp.52-68. Parish, E.S., M. Hilliard. L.M. Baskaran, V.H. Dale, N.A. Griffiths, P.J. Mulholland, A. Sorokine, M.E. Downing, R. Middleton, and N.A. Thomas. 2012. Multimetric spatial optimization of switchgrass plantings across a watershed. Biofuels, Bioproducts and Biorefining. 6: 58-72. Grissino-Mayer, H. D., J. T. Maxwell, G. L. Harley, N. A. Garland, D. H. Holt, C. Absher, B. J. Beale, M. S. Boehm, K. A. de Graauw, A.-M. Rautio & A. W. Dye (2013) Dendrochronology reveals the construction history of an early 19th century farm settlement, southwestern Virginia, USA. Journal of Archaeological Science, 40, 481-489. Julie McKnight was a primary author of "The Water-Energy Nexus in East Tennessee," White Paper 2-13 commissioned and published electronically by the Howard H. Baker, Jr. Center for Public Policy. The paper is 50 pages long and has seven appendices. Authors of the paper are listed alphabetically, with professors listed first, followed by graduate and undergraduate students. 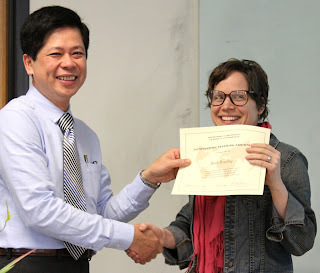 So, even though she is listed sixth, Julie led the development of the outline and research questions for the paper, did much of the writing, and oversaw the work of the other students. A geography undergraduate student, Hope Tracy, also contributed to the project and was one of the listed authors. Julie presented a summary of this work at the AAG meeting in Los Angeles. Delahunty, Tina; Lewis-Gonzales, Sarah; Phelps, J.; Sawicki, B.; Roberts, Charles; Carpenter, Penny. 2012. Landcover Change and Remote Sensing in the Classroom: An Exercise to Study Urban Growth. Journal of Geography, 111(3), 113-122. Xu, Y., Shaw, S-L. (accepted). Exploring Spatio-temporal Changes of Flickr Geo-tagged Photo Locations. Geo-computation. D. Wang, S. Kang, J. Nichols, W. Post, S. Liu, Z. Zhao, (in press). A computational framework for spatially explicit agroecosystem modeling: Application to regional simulation. Journal of Computational Science. D. Wang, Z. Zhao, S-L. Shaw, G. Ragghianti, Y. Wei, (accepted). Building a high performance ArcGIS cluster. ArcUser. Sarah Jones was selected to intern at the National Geographic Society for a very competitive position. This spring semester, she is part of their Education Programs for Curriculum Development and Outreach where she is editing activities and lesson plans and uploading these to the NatGeoEd.org webpage. She is doing so well that her supervisor offered her a contract (paid) position in the Education Programs for the summer and possibly beyond, but I believe she will be turning this down sadly so that she can concentrate on completing her master’s degree this coming fall semester. 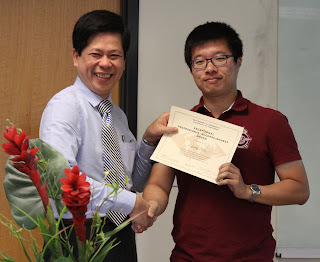 Ziliang Zhao was selected to be a research assistant at the National Institute for Computational Science (NICS) from the fall of 2012. 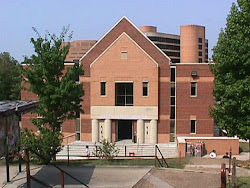 His research at the NICS is funded by Extreme Science and Engineering Discovery Environment (XSEDE). Ziliang’s work at NICS includes benchmarking the most-used scientific applications and identifying the optimized configuration for each application on Kraken (the most powerful supercomputer in the world managed by academia, it ranks 25 in the Top500 List). Ziliang’s research outcome in the first two quarters was highly appraised by XSEDE, which authorized to extend the work to other six supercomputers, including Blacklight, Gordon, Keeneland, Longhorn, Stampede, and Trestles. This research would help high performance computing (HPC) users select the optimized configuration to build scientific applications and save a large amount of research budget on scientific computing for various projects. John Eads has received exceptionally strong evaluation scores and comments from students, peers, and faculty for his work as a GTA in Geography 131 and 132. In Fall 2013, John’s SAIS average evaluation score for the four major questions applicable to lab GTAS was a whopping 4.7 out of 5, highest of all GTAs. 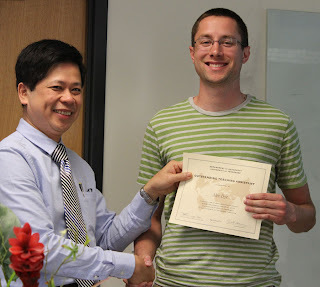 On the paper evaluation forms we distribute in lab, 95% of students marked John as “excellent” across the board in being prepared for lab, helping students understand the lab, speaking understandably, and contributing positively to student learning in Geography 131. Open ended comments described John as engaging, enthusiastic, very helpful, and always displaying a great attitude. He made lab enjoyable but also made students work, as revealed by these comments: “John made lab entertaining, he always helped a lot but he still made us think before he gave us the answer,” and “He was extremely helpful in lab without being overbearing or just giving away the answers.” John’s goal upon graduating in 2013 (from the vitae in his thesis) is to share his love for Geography with the rest of the world in any way he can. Thanks, John, for sharing that love (and your knowledge) with our 131-132 students! Brenna Elrod has done an outstanding job completing her duties as the teaching assistant in Geog 310 and assisting when needed on projects in the cartography lab. In Geog 310 she is always available to assist students with class assignments and maintains a good, approachable relationship with them. She does an excellent job with her grading responsibilities, class communication, and independently maintains the class records quite well. Brenna participates in class and lab discussions, which add to a team style of teaching that greatly helps our undergraduates learn the finer points of mapmaking. Brenna is a very dependable and self-motivated worker. Her hard working, pleasant disposition makes her a pleasure to work with and I would have to rank her among the top workers I have had in this office. Kevin Krivacsy was a joy to work with. He required minimal direction. He was always willing to go the extra mile. He never dropped an assignment. He brought a fine intelligence to grading. He was diligent in carrying out his duties and popular with the students. In other words, he was the complete package plus, all wrapped in that singular and unmistakable Krivacsy mystique. Ruth Bowling is always grading promptly and staying on top of her duties. She is also very kind and helpful with her students. She keeps them updated with her schedule, she is attentive and helpful in class, and, when reporting potential issues with students with me, always gives her students the benefit of the doubt. She really cares about her students and their success--and it shows! Basically, she is wonderful and any instructor would be lucky to have her as a TA. Jesse Piburn has a perfect GPA of 4.0. He is a very good student and has made good progress in his MS program. As the lab GTA for GEOG 411 in Spring 12 and Fall 12, Jesse was in charge of all three lab sessions on Friday and he did a great job for both semesters. He developed a good relationship with students, so they felt comfortable to ask him any questions in and outside of the computer lab. He is an active graduate student in the department, always being willing to help others and the department if needed. He was the second author of a poster at the 2012 AGU meeting. 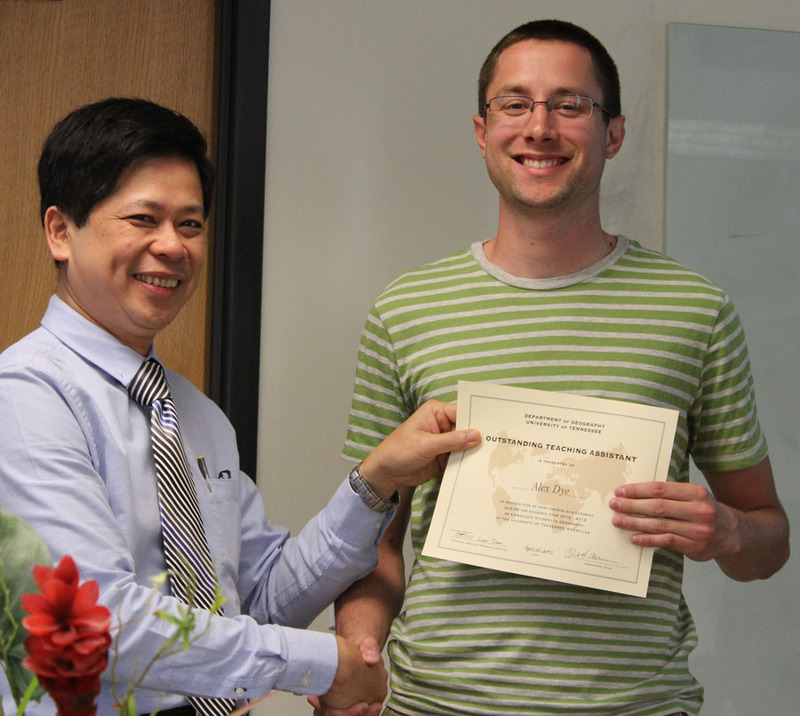 He is also the second author of a manuscript submitted to ASCE Journal of Hydrologic Engineering. 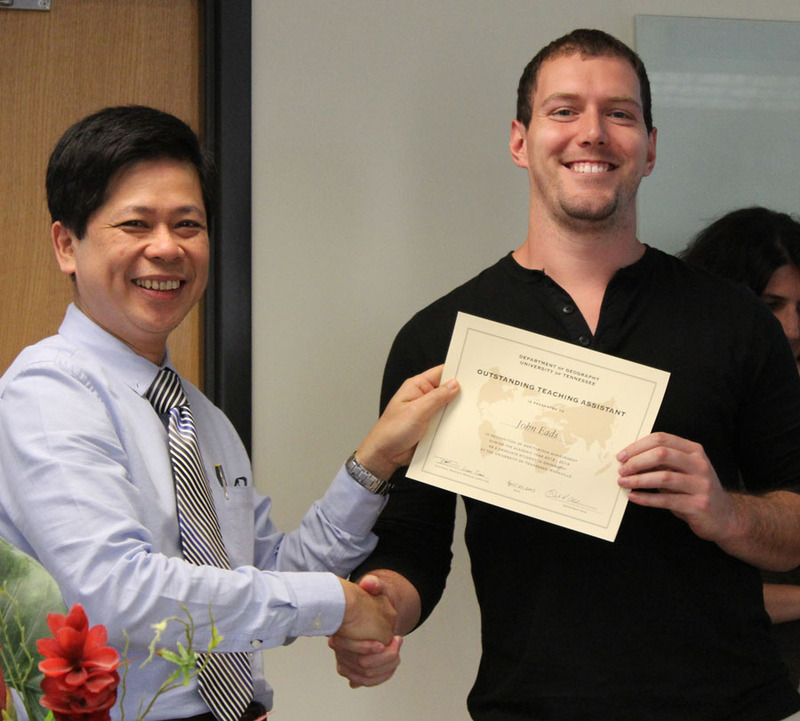 Derek Martin is an excellent student and has made good progress in his degree program. 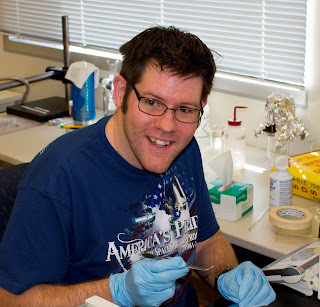 This spring, he completed both special field exams, and he will officially advance to candidacy as soon as he finishes some revisions to his dissertation proposal. In the past two years, he has presented results of his research at both AAG and SEDAAG meetings. 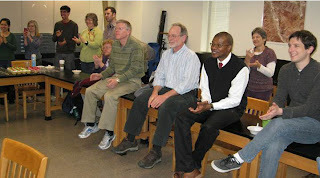 Derek has been a leader in the seminars he has had with me and has taken an active role in seminar discussions. 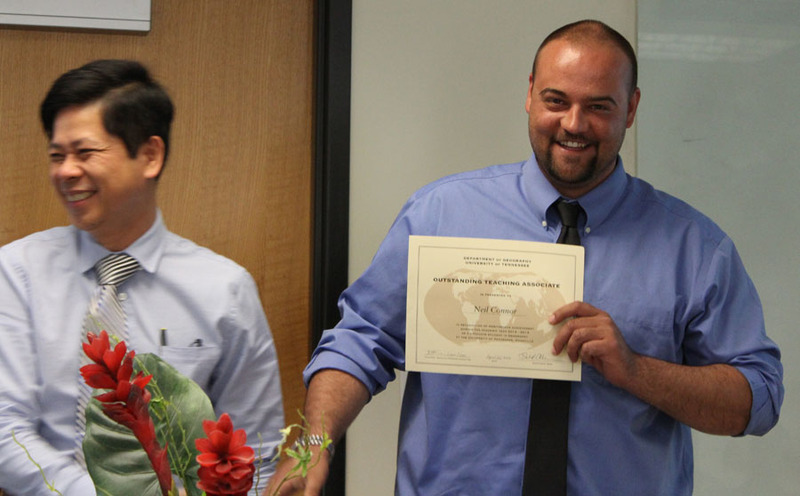 He has been recognized as an outstanding GTA and GTAssociate and has received the department’s publication award, as well as an OIT award for improving teaching. 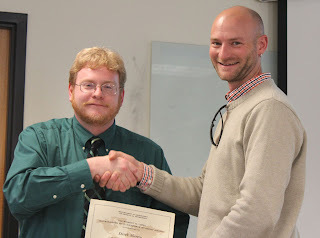 Derek is an excellent teacher who has served as a GTAssociate for four semesters, teaching both Geog 131 and Geog 132. 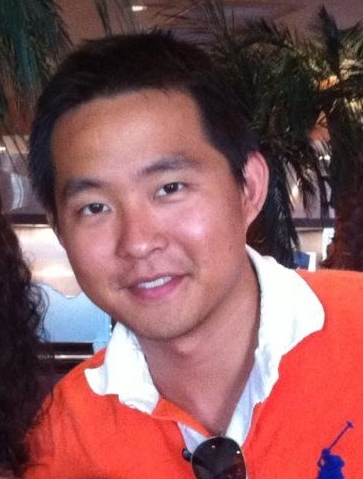 In addition, he has been a leader among the graduate students, having served as Treasurer, VP, and President of GARG. He was the student representative to the search committee for the position now occupied by Dr. Washington-Allen. Derek has taken graduate courses in three different departments (Civil and Environmental Engineering, Sociology, and Biosystems Engineering and Soil Science), in three different colleges, and represented our department well across the campus. I think he exemplifies the spirit of the Long award." 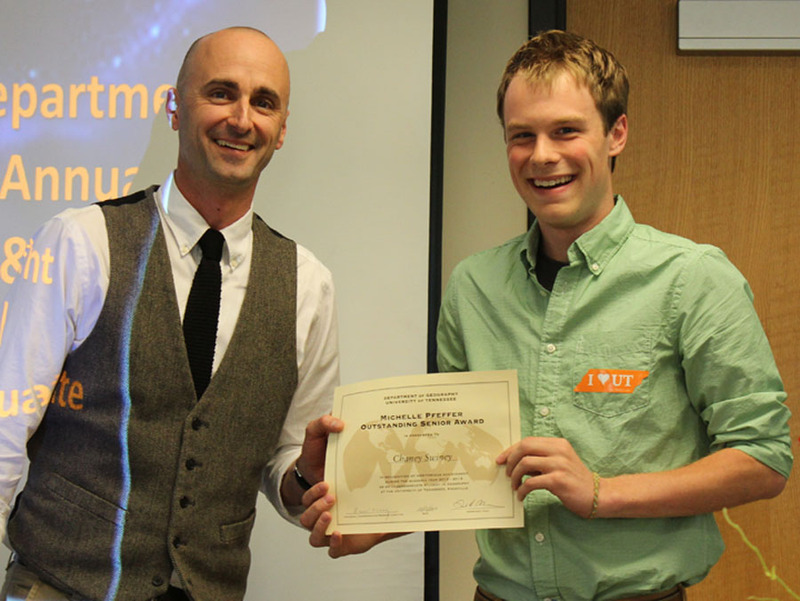 Undergraduate Paul Lemieux Receives Prestigious NASA Internship! Geography major Paul Lemieux will conduct research this summer at the Marshall Space Flight Center in Huntsville, Alabama as a recipient of a prestigious NASA internship. Paul will investigate how NASA remote sensing data can be used to better characterize and understand issues associated with human health and climate change, particularly in the SE USA, and how results can be used to assist decision makers in making better decisions on public health and the impacts of climate on humans and the environment. 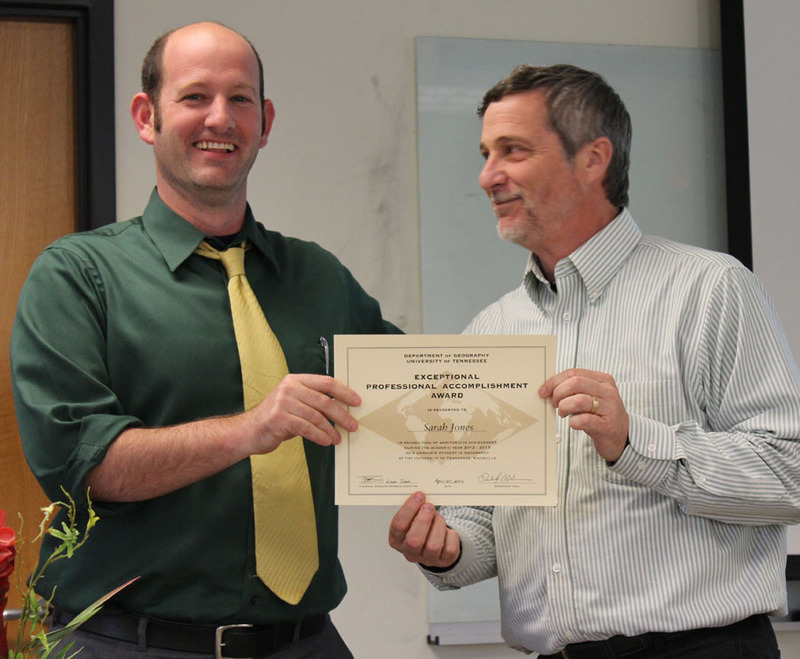 Paul will work with NASA scientists to download the needed remote sensing data, analyze data, and integrate data into a GIS format to perform modeling of human and environmental factors that relate to climate and related impacts outcomes from climate models. Paul and his wife, Brandy Lemieux, are both geography majors at UT. They recently transferred from Memphis State University because they thought they could do more in Geography at UT. Looks like this was a good move! Paul has been working in our Laboratory of Paleoenvironmental Research, gaining first-hand experience in the study of past environmental change from sediment records as part of coursework in Geography 494 (photo below). His NASA internship on remote sensing as applied to future environmental change will be a great complement to his 494 work, and an important professional experience. Way to go, Paul! More honors for geography major Sarah Bleakney! We are pleased to share the great news that Sarah has received an Ernest F. Hollings Undergraduate Scholarship from the National Oceanographic and Atmospheric Administration (NOAA). This prestigious award provides two years of financial support for Sarah's undergraduate work in geography and a research internship in summer 2014. So it's research in Costa Rica this summer for Sarah and research with NOAA next summer! But there's more! Sarah also applied for and received a NASA internship. She couldn't fit that one into her schedule so had to decline, but still an honor and WOW is all we can say! Good thing we convinced Sarah to major in Geography instead of Global Studies, given all these great opportunities that have come her way! Geography major Sarah Bleakney has been selected to participate in a Research Experience for Undergraduates (REU) project in Costa Rica and Texas this summer. 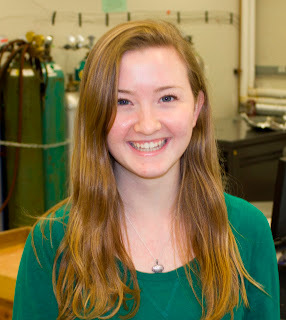 In this project headquarted at Texas A&M University and sponsored by the National Science Foundation, Sarah will be part of a team of three undergraduate students and five faculty members who will carry out research on tropical climatology and meteorology. She will spend part of the summer on the Texas A&M campus in College Station, Texas, and part at the Soltis Center field station in northern Costa Rica. 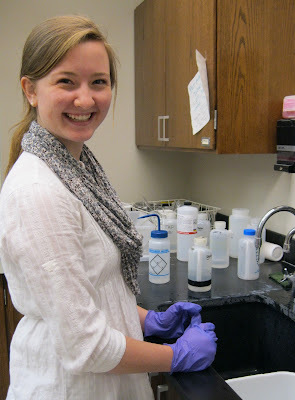 Sarah is presently working in our Geography Department's Laboratory of Paleoenvironmental Research as a Geography 494 student, studying sediment core samples from Costa Rica. This lab experience and her stellar academic record gave Sarah the edge over more than one hundred applicants from across the country who applied for the seven research internships open this summer in the Texas A&M REU. Congratulations to Sarah for winning one of these highly competitive internships! Dr. Margaret M. “Peggy” Gripshover, associate professor of Geography at Western Kentucky University has been appointed State Geographer for the Commonwealth of Kentucky by Gov. Steve Beshear. Dr. Gripshover is the first woman to hold the position, which was created by the General Assembly in 1984. Dr. Gripshover is an important part of the UT Geography Community. 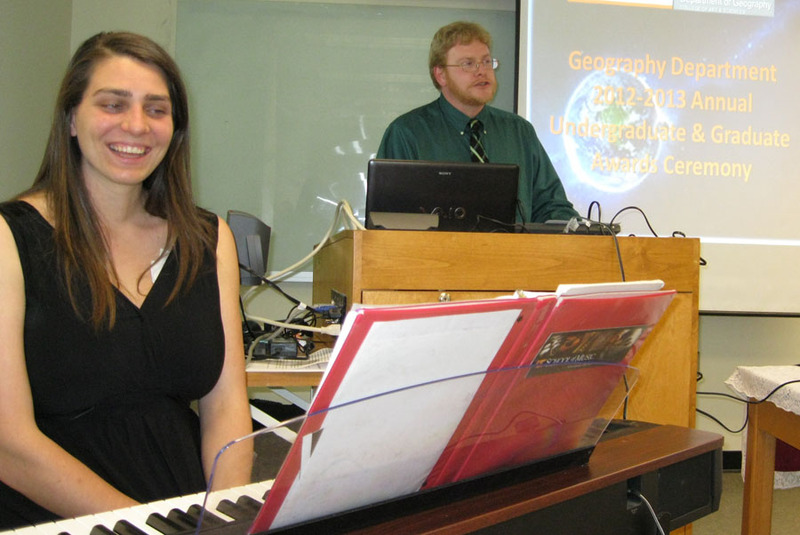 She earned her Ph.D. in Geography from the University of Tennessee, Knoxville. Prior to coming to Western Kentucky, she was a faculty member at the University of Tennessee and an extremely popular instructor among UT students, who called her “Dr. 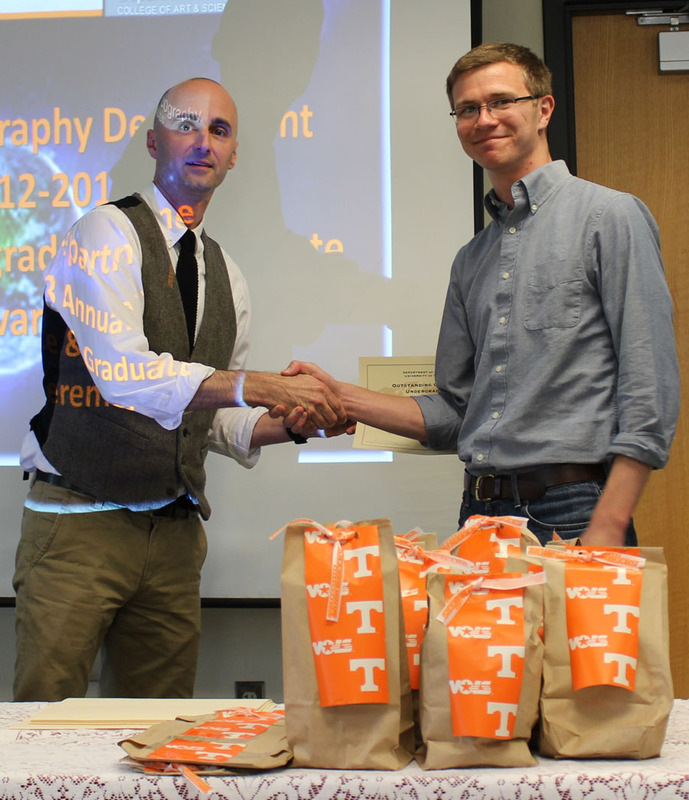 G.” While at Tennessee, Dr. Gripshover received the Chancellor’s Teaching Award, the University of Tennessee Alumni Association Outstanding Teaching Award, and an Excellence in Teaching Award from the Southeastern Division of the Association of American Geographers. Please join me in congratulating Dr. Gripshover for this important recognition. PhD student, Gengen He, has been selected by the U.S. National Science Foundation to receive an EAPSI (East Asia and Pacific Summer Institutes) award. This is a very competitive award open to U.S. graduate students in science, engineering, and education. The total award is approximately $15,000. Gengen will spend three months (June – August 2013) conducting research with Dr. Toru Ishikawa at the University of Tokyo in Japan. 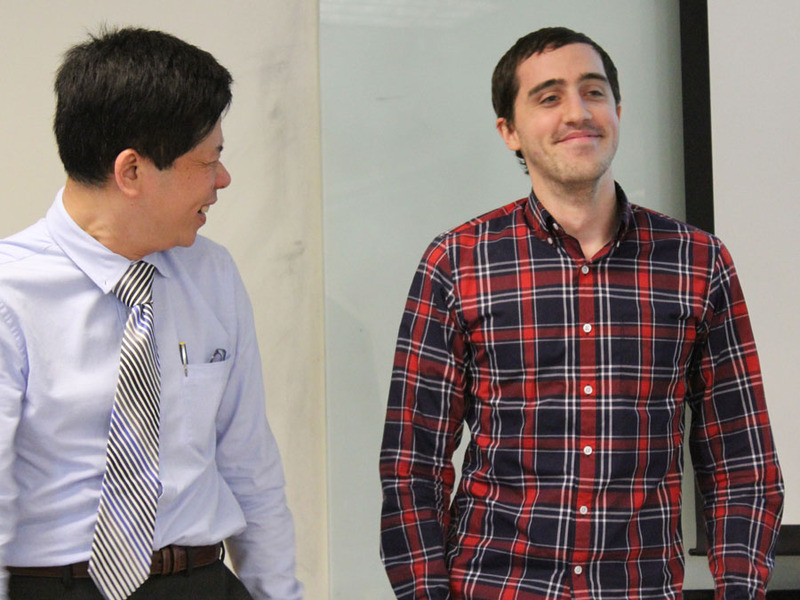 His project entitled "Investigating Collaborative Navigation in a Culturally Unfamiliar Setting" combines research in transportation, technology, human cognition, and behavior. 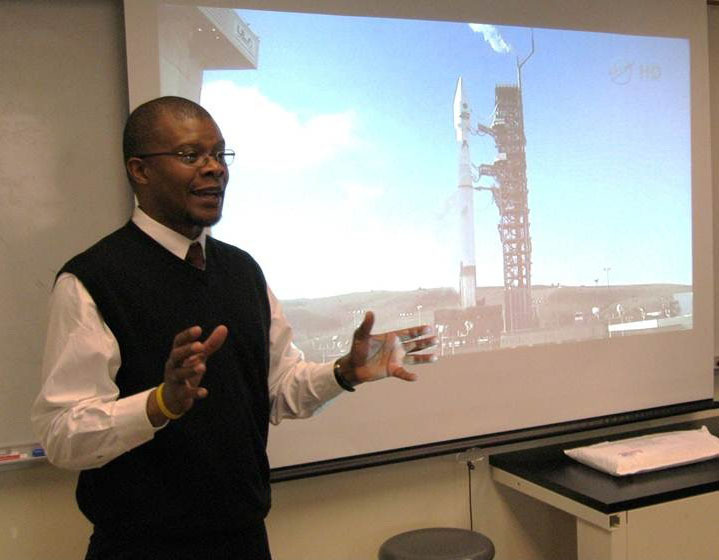 On February 11 2013, students and faculty gathered to celebrate the successful launch of Landsat 8, with a "launch party" hosted by new UT Geography faculty member Dr. Robert Washington-Allen. Dr. Washington-Allen joined the Geography faculty in January 2013. Formerly a faculty member in the Department of Ecosystem Science and Management at Texas A&M University, Dr. Washington-Allen will teach upper division (Geography 413) and graduate-level (Geography 513) courses on remote sensing; a course for undergraduates on the geography and ecology of pastoralism in drylands (Geography 309 in Fall 2013), and other courses in physical and technical areas of geography. Dr. Henri Grissino-Mayer recently received the following email from Phillip Lewis, a 5th grade teacher at Talbott Elementary School in Jefferson County. It came right after Phillip was notified that he had been awarded the Lottie and Alden Beverly Geography Teacher of the Year award from the Tennessee Geographic Alliance. Phillip was chosen for the award based on a very strong letter of recommendation from his principal that stressed the success of his classes’ tree ring project. The Lottie and Alden Beverly Geography Teacher of the Year Award is given annually and is made possible by a generous donation to the Tennessee Geographic Alliance from the Tom and Bruce Ralston families. This is Phillip Lewis. I am the elementary school teacher that brought the segment of the Red Oak tree for you to help me date this summer. I wanted to update you on my progress. I built a stand for the piece and it is now displayed in my 5th grade classroom. The students have been researching dates to place on the timeline. The students are really enjoying the process and are very eager to learn as much as possible. 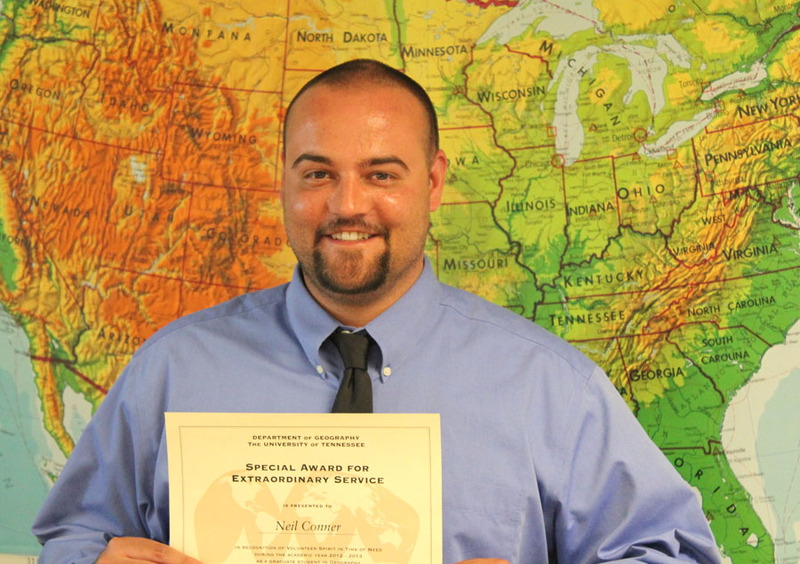 I recently won the Geography Teacher of the Year through the Tennessee Geographic Alliance. Part of my nomination came from the way I incorporate the tree into our lessons. 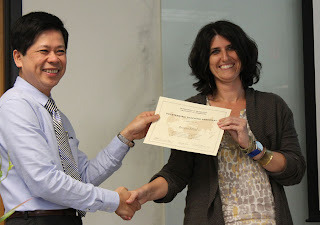 I want to thank you again for all the help you provided me and for helping me to achieve success in this endeavor. I have enclosed some pictures of our progress so far. We still have much to do but the kids can see the direction we are going.